How to video record a portion of your screen with Bandicam? If you’re into video tutorials, you need a good, reliable software to video capture your screen. 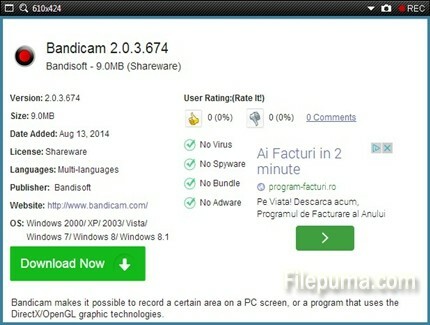 There are not a lot of options out there but with Bandicam you can do it in just a few steps. Step One: First you need to download the shareware software from Filepuma.com by clicking on the green “Download Now” button. Step Two: After the installation and starting the program you will have the interface shown in the picture below. You need to select the output folder first and then click on the white rectangle button highlighted with the left red arrow. Step Three: Immediately you will see a new window with a transparent frame. It is the portion of the screen that is going to be recorded. You can modify the resolution of the frame by dragging one of the corners of the frame. Tips: In the picture below I framed the portion of the screen relevant to downloading the Bandicam software.